If your smile is damaged by chipped or broken teeth, or if you develop cavities, we can help. Dr. Thomas specialises in restorative dentistry, and as an active member of the Canadian Academy of Restorative Dentists and Prosthodontists, she has extensive knowledge of the latest treatments and materials for restoring teeth. 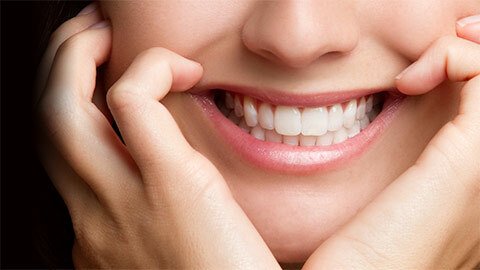 You can count on her to provide natural-looking and long lasting solutions to restore your smile. We repair cavities with modern synthetic ceramic or composite fillings that are as strong as your natural teeth and blended to match the colour of the repaired tooth. We also safely remove and replace mercury amalgam fillings. Crowns are a natural-looking replacement for teeth which are severely damaged and can't be restored with other methods. Our crowns are made from porcelain or ceramic and are shaped and coloured to match the surrounding teeth perfectly. Inlays are used to repair teeth that can't be repaired with a filling but that don't need a crown. They're used in the "valleys" of your teeth between the cusps. Inlays are very strong and are colour-matched to the surrounding tooth. Onlays are similar to inlays, except they're used on the cusps themselves and are used to restore the tooth's biting surface. Onlays are as strong as natural teeth and can withstand normal biting and chewing. Dental bridges are used to fill in gaps left by one or more missing teeth while preserving your bite and the alignment of surrounding teeth. They use natural-looking artificial teeth that are designed and coloured to match your smile. They're a comfortable and long-lasting solution to restoring missing teeth. If you have suffered damage to your teeth and smile, contact us today to set up an appointment for restorative services.